We all deal with changes in weather and climate in different ways. However, for a certain part of the population, shorter days with less sunlight and cloudy days can be problematic. This can be exacerbated in the elderly population as they are limited already in their ability to go outside and access sunlight. 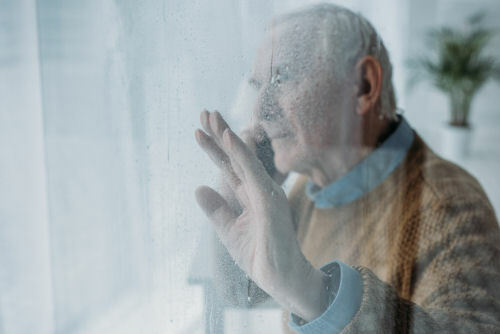 If you find that at certain times of the year, your loved one seems to have less energy, changes in appetite or sleep, irritability, or loss of interest in socializing and other activities, it might be Seasonal Affective Disorder as opposed to depression, as these symptoms are similar to depression. It’s helpful to talk to a loved one about this, if he or she is able to share thoughts or feelings. You can certainly take them to the doctor and talk with the physician about your observations and what your loved one is noting as well. Light Therapy: Use a light box if they do not have access to ample sunlight. Daily exposure to sunlight -at least about 20-30 minutes is very helpful- if your loved one has the time and the physical help to get outside and the weather permits. We all know that as we age, we’re more susceptible to feeling uncomfortable in cold weather. This can deter elderly people from wanting to go outside. If they can sit in a heated sun room, that is better than a darkened living room. Vitamin D: Making sure that their diet has vitamin D in it is helpful as well. When they do access the sunlight, their bodies will have a better chance of converting and absorbing the vitamin D and being healthier overall. Relocation: If your loved one happens to live in a geographic area of the country that has significantly more cloudy and gloomy days than other areas and you find that this is a significant problem for them, it might be that if you live in a sunnier area, they can move closer to you.